Our nursery is small so we wanted a feature wall with high impact that could also transition to a different gender or something that our little one would not outgrow in the future. 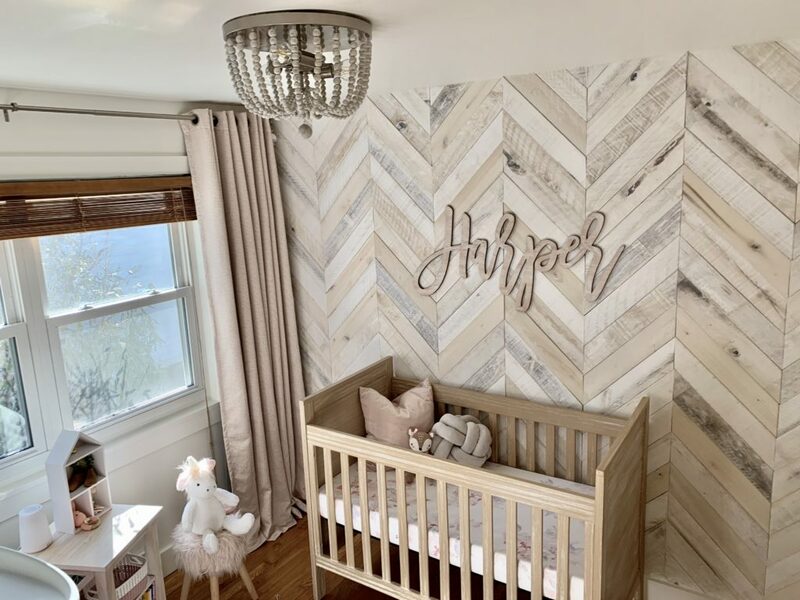 We went with a white washed wood in a chevron pattern and white walls so that way we could easily switch out the pink curtains and accessories if needed. We love how it turned out! This is so beautiful! I love everything! Where can i get all of thsese? Beautiful! Can you share where the wood for the wall came from and who did this for you (hoping you’re atlanta based)?! What a beautiful space! Thank you for sharing here on Project Nursery. I hope you’ll consider adding some sources—as you can see, it’s already a popular nursery with our readers! Hi There! Thank you to everyone for the nice comments! I added links to most items! Brandi: We got the White washed wood from Home Depot (link is above). We did the wall pattern and install ourselves. However, we did nothing to the wood, it already came with all the unique coloring right out of the package!